THE B-MOVIE NEWS VAULT: Campy Creatures are coming from Keymaster Games in August 2017! 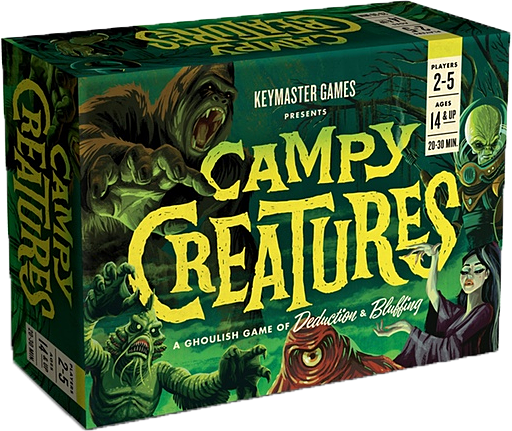 Campy Creatures are coming from Keymaster Games in August 2017! 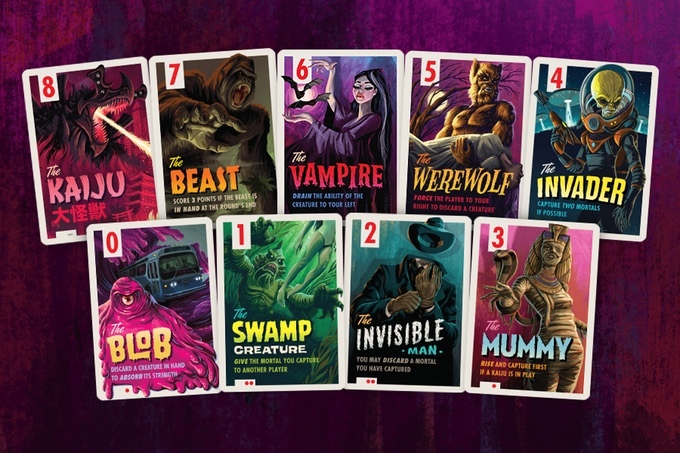 CAMPY CREATURES: A GHOULISH GAME OF BLUFFING, DEDUCTION, AND SET COLLECTION HAS BEEN FULLY FUNDED ON KICKSTARTER! Honestly, the box art's already got me sold on this game! First of all, allow me to apologize to Mattox Shuler from Keymaster Games. He had sent me information about this game weeks ago, and I somehow ended up condemning his e-mail to a spam folder! Had I not kept meticulous notes on what , I probably would have forgotten all about this cool-looking card game! And while this news was time sensitive, I am very happy to announce that this game is not only fully funded, but has more than tripled the initial goal of $15,000! If you still want to contribute monetarily, just visit the Campy Creatures Kickstarter Page to make a pledge! As mad scientists, each player has been tasked with the goal of capturing "Mortals" for future experimentation. Players have an army of Campy Creatures to do their bidding (including a Blob, Vampire, Werewolf, and Kaiju) with three nights to get the job done! Be warned though—the Mortals won’t go out without a fight. Campy Creatures is for 2 to 5 players, and each full game takes approximately twenty, to thirty minutes to complete! Each player is given an identical hand of Creatures. A turn begins when Mortals, Traps, or other Artifacts are revealed. Mortals are worth positive points, traps are negative, and artifacts give players different abilities. Each player simultaneously chooses a Creature and places it face-down. Once all have chosen, the Creatures are revealed and their abilities resolve. The Creature with the highest strength collects a card first, the second highest goes next, and so forth. A new turn begins when new Mortals, Traps, and Artifacts are revealed. A night lasts for six turns, and the player with the most victory points after three nights wins. The awesomely designed "Creature Cards" for the game! With funding secured, Keymaster Games is planning to unleash Campy Creatures in August of this year. It currently only costs $20 for the game, and is a guaranteed good time for b-movie monster fans, ages 8 and up! There will also be a free iOS and Android app to coincide with Campy Creatures, AND there are also plans to release a limited edition series series of beer (courtesy of Bottle Logic Brewing) to either drink while playing Campy Creatures, or enjoy at your leisure. These will be tart ales, and each release over 2017 will feature a different creature from the game! Pretty damned cool, right? If you're sold on Campy Creatures (like I am), CLICK HERE to secure your very own copy now! Still kind of unsure about the game's mechanics? Have no fear, for the gents at Keymaster Games have got covered! Just watch the short YouTube video below to give yourself a better idea of how Campy Creatures works!